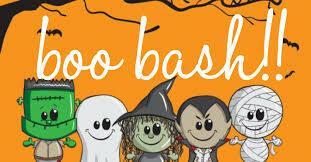 The first ever Boo Bash will be hosted in Buffalo on Saturday, October 27th. 10-12 pm: ECFE in Sturges Park. No cost. 10-10:30 am: Walk the Pumpkin Path to the library for a short story time and to pick out some books. Head back to Sturges Park for more activities planned by ECFE. No cost. 10:30-12 pm:Food Truck Fare. Fee. 12 pm (start): Booffalo Run 5k. Fee. 1:30 pm (start): Candy Corn Fun Run/Walk 1k. Fee. 2-4 pm: Buffalo Merchant Trick or Treat. No cost. Hosted by BHM Community Education in partnership with Buffalo Great River Regional Library, Buffalo Chamber of Commerce, City of Buffalo, BHM Early Childhood Family Education (ECFE) and Opening Doors for adults with disabilities. Some activities are free. Others have a fee associated with them.